Two posts ago, I asked the question: Do you save enough for retirement? Based on our example "Popoy," it seems that saving 32% of a 30,000-a-month income would not be enough to cover retirement expenses. 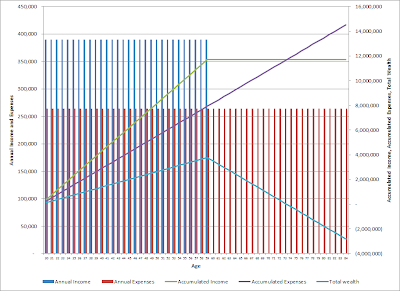 In the graph above, using our example we plot annual income (blue bars) and annual expenses (red bars) against the left vertical axis; to help with our analysis, we also plot accumulated income (green line), accumulated expenses (purple line), and total wealth (blue line) on the right vertical axis. 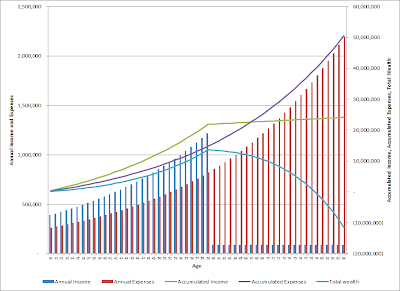 The graph shows what happens before and after you retire/stop working: before retirement, as income is greater than expenses, you accumulate wealth; after retirement, you stop earning and continue spending, which depletes your wealth. We see here that at around age 75, Popoy's wealth will have been depleted to zero, so he would have too look for alternative sources of income to finance his expenses for the rest of his life. Suffice it to say, the objective of any retirement or financial planning exercise it to be able to achieve zero or more total wealth at the end of the planning horizon. Unless we want to look at real (i.e., constant-price) cash flows, we need to take price increases every year into account. Our example only considers basic, recurring expenses. As a person gets older, the likelihood of incurring substantial medical expenses increases. 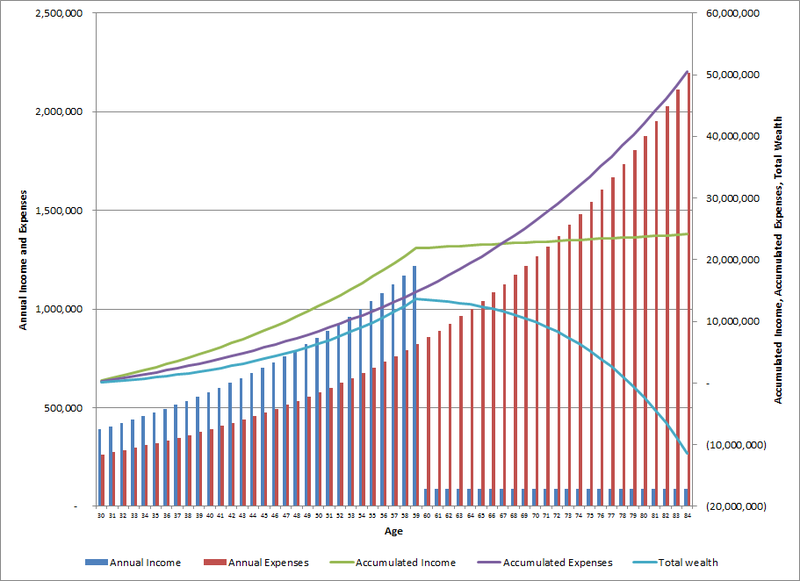 A person's lifestyle of choice pretty much determines his or her level of expenses. In our example, we assumed that Popoy will maintain the lifestyle that he has today. We can reasonably assume that income will increase by some rate every year, even if we don't get promoted. Apart from any retirement bonus provided by our employer, we should at least get a small pension from SSS or GSIS. For example, from the SSS website, members are entitled to a maximum pension of 7,500 per month, fixed. People who have already started saving before age 30 would have a certain amount of "beginning" wealth. We can thus incorporate the above factors in our analysis by using realistic assumptions. I made a simple "dynamic" Excel template where you can change inputs and see how cash flows and total wealth change correspondingly. You may download the file here. In this second graph, we see the profound effect that rising prices can have on wealth. Compared to the previous example, while bankruptcy occurs significantly later (80 years old vs. 75) the wealth deficit at the end of the planning horizon is much worse (11.4 million pesos compared to 2.8 million). Using this tool, we see that Popoy needs to do something to make ends meet after he retires. If the goal is zero total wealth at age 85, what alternatives are available to Popoy and what set of inputs can lead to this goal? Also, remember that in our example, Popoy is single and is responsible only for his personal expenses. How would his future cash flows be affected if he is married, if he has kids or other dependents? 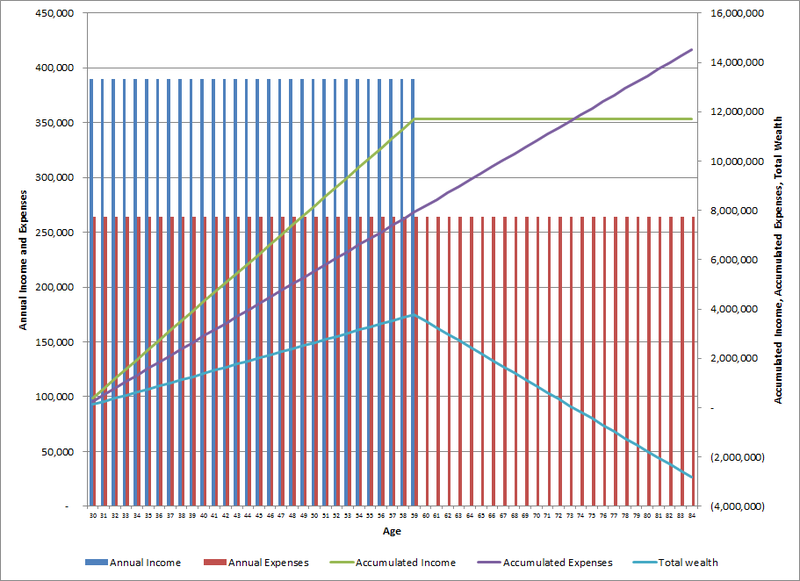 How would cash flows change if our unit of analysis is a household rather than an individual? Are you happy with what you see if you plot your personal circumstances into the template? If you have time in the next couple of days, please play around with the template, and see you can give some suggestions in the comments section below. We'll explore possible answers next week.